Carroll, Joseph Francis Carroll a retired Air Force Lieutenant General and the first head of Defense Intelligence Agency has died at a nursing home in Alexandria, Virginia, at the age of 80. He had lived in Alexandria. He died of pneumonia, said wife May Ann. He was a US Air Force officer who was involved in national security affairs for 30 years. Headed Defense Intelligence Agency from creation in 1961 until he ret in 1969. Agency intended as a special unit to coordinate intelligence activities of the separate services. Before that, was USAF IG conducting investigations of suspected security violations, including 1960 defection to the Soviet Union of two employees of the National Security Agency. Previously he was Deputy Commander and Chief of Staffo of the U.S. Air Force in Europe, and 1950-1958 he was Deputy Inspector General for Security of the Air Force. General Carrol was born in Chicago, March 19, 1910. In 1933 he graduated from St Mary's College in Mundelein, Ilinois. He then worked for Swift & Company, the Chicago-based meat-packing concern, and while there studied law at Loyola University. After graduating in 1940, he joined the FBI as special agent. In 1945 he was borrowed by the Justice Department to form an investigative unit to deal with disposal of surplus war property. In September 1947, when the Air Force was established as separate military branch, the bureau again lent him out, this time to organize and direct the Security Division for the Air Force. This required that he be commissioned as a Colonel in the Air Force Reserve. After retiring from government, he was Executive Director of the National Council of Catholic Men and a consultant on security matters. He was buried with full military honored in Section 7-A, Grave 178, Arlington National Cemtery. 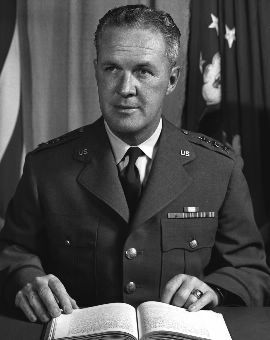 Lieutenant General Joseph Francis Carroll was the director of the Defense Intelligence Agency, with the responsibility for controlling Department of Defense Intelligence resources assigned to DIA and reviewing the intelligence functions assigned the military departments in satisfying the intelligence requirements of the Department of Defense. 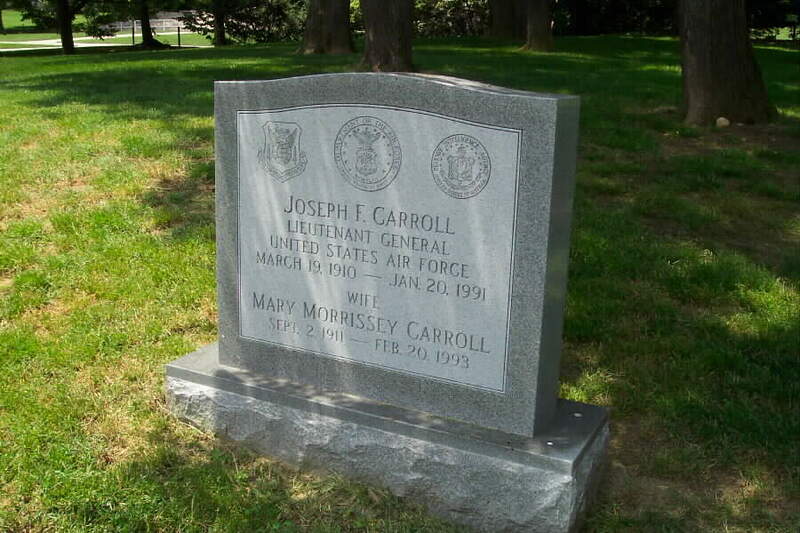 General Carroll was born in Chicago, Illinois, in 1910. He graduated from St. Mary's College, Mundelein, Illinois, in 1933 with a bachelor of arts degree and holds a doctor of jurisprudence degree from Loyola University, Chicago, Illinois, 1940. He has been a member of the Illinois State Bar Association since 1940. After working with Swift and Company in Chicago, where he rose to a position as assistant sales manager, General Carroll joined the Federal Bureau of Investigation in October 1940, where he served as a special agent in field offices at Memphis and Knoxville, Tennessee, as well as Chicago, Illinois. In May 1944, he was transferred to the Washington headquarters of the FBI, where he held progressive positions as supervisor in charge of bank robbery and kidnapping matters, chief of the Criminal Section, and first assistant to the assistant director of the FBI in charge of the General Investigations and Accounting Division. Compliance Enforcement Division, directing all investigative activity associated with surplus property disposal. In May 1947, he was recalled to his former position in the FBI as an administrative assistant to the director of the FBI. tendered a commission as a Colonel, U.S. Air Force Reserve, January 12, 1948. He was ordered to active duty in the grade of brigadier general May 6, 1948, and promoted to Major General August 11, 1950. From the time of his entry on active duty on May 6, 1948, General Carroll served as the first director of the Office of Special Investigations, creating and organizing this centrally-directed investigative service, establishing district offices to service the air commands in the United States, and furnishing trained specialists to Air Force activities worldwide for the conduct of special investigations. On September 6, 1950, he was appointed deputy inspector general for security, U.S. Air Force, In this assignment he was responsible for the security and physical protection of Air Force installations and activities against sabotage, espionage, and other hostile threats. In this capacity, he directed the Office of Special Investigations, the Office of the Provost Marshal, U.S. Air Force, and was responsible for all security plans and policy for the U.S. Air Force. Until this time, General Carroll had been a member of the U.S. Air Force Reserve on active duty, On January 29, 1952, he was integrated into the Regular Air Force as a permanent Colonel by a special act of Congress. General Carroll was ordered to Wiesbaden, Germany, April 1, 1958, as deputy commander (Rear) for the U.S. Air Forces in Europe. He served in that capacity until November 1959 when, under a command reorganization, he was named chief of staff, U.S. Air Forces in Europe. On February 1, 1960, General Carroll was promoted to Lieutenant General and became The Inspector General of the U.S. Air Force with duty station in Washington, D.C. He remained in that position until October 1, 1961, when the Secretary of Defense appointed him to his assignment as Director of the Defense Intelligence Agency. His military decorations include the Distinguished Service Medal and the Legion of Merit with oak leaf cluster. 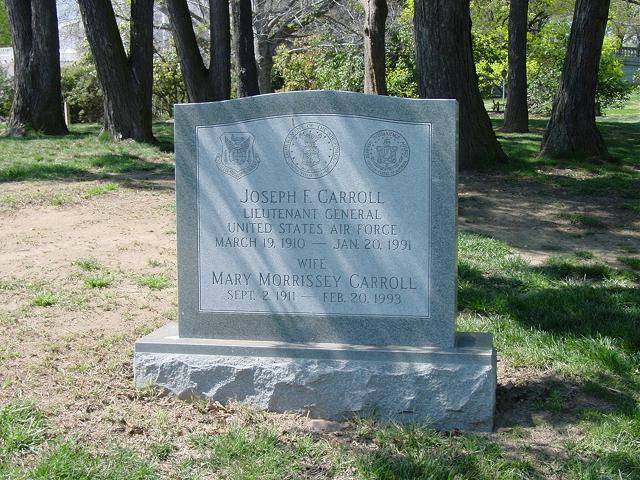 General Carroll was buried with full military honrs in Section 7A, Grave 178, Arlington National Cemetery.